So, I got 7 out of 10 on Tuesday and let's just say I didn't take Finland's non-qualification well. There are some songs which, for whatever reason, you just have a feeling that they're not qualifying. I didn't have that feeling with "Blackbird". Not only did I think it would qualify but I genuinely felt that this song would get a top 10 placing on Saturday night. Instead, we just wonder what might have been. I will review the first semi-final in more detail in the next few weeks but I wanted say that - apart from the non-qualifications of Finland, Latvia and Iceland - there were other disappointments throughout the evening. The vocal shortcomings of many of the artists, for one. And despite "Celebrate Diversity" we had three male interchangeable identikit robot-hosts. Now we all know that Petra is a very tough act to follow, but were these three the best that Ukraine can do? Having said that though, at least Timur is quite nice to look at *shallow alert*. So let's have a look at tonight's semi-final 2 and the songs I think will qualify. SERBIA: "In Too Deep" - Tijana Bogićević. This song has never had any impact on me from day one. It goes down the very same musical road of "Walk on Water" - enough said. I've liked a few of Serbia's songs in recent years but this is just far too anonymous. AUSTRIA: "Running On Air" - Nathan Trent. One of this year's most likeable and charming participants, with a sweet and likeable song, and cute staging to match. Austria is maintaining its very strong resurgent phase at ESC and it looks like it will continue this year. I worry of course about the 2nd-placed draw of doom, but hopefully it will work to his advantage after that anonymous opener. FYR MACEDONIA: "Dance Alone" - Jana Burceska. In its studio version, this is one of the songs I've played quite a lot this year. It's just a straightforward upbeat pop song, and there are never too many of those at ESC these days. However, rehearsal footage indicates a rather trashy and tacky presentation which may put off many of the juries and televoters. MALTA: "Breathlessly" - Claudia Faniello. As old-school 90s ESC ballad as you're likely to get this year. She has a very strong voice and has tried so hard for years and years to represent Malta so I'm happy for her that she's finally made it to ESC. However I think this will just get lost and won't appeal to those who like a more contemprary ESC song. ROMANIA: "Yodel It" - Ilinca feat. Alex Florea. I mentioned in one of my previous posts that although I didn't hate any of this year's songs, there was one which I really wouldn't want to win. This is it. I know it's a controversial opinion as this is hugely popular in the fandom, but I just find it intensely irritating. Ilinca's yodelling talent can't be disputed but the whole mix of rap and yodelling just screams clip-show fodder for the next 20 years. Yes, it's a fun song, and boy oh boy do we need more fun in an often very po-faced line-up of songs, but this is just not to my taste. NETHERLANDS: "Lights and Shadows" - O'G3NE. Good old Oh-Gee-Three-Knee haven't been so popular with the fandom since this song was chosen. The song isn't as good as it should be, and yes they are certainly far better than the song. I've seen lots of clips on YouTube and their vocal harmonies are never anything less than tremendous. This is one of 2017's most underrated entries and although I still have reservations about the song, their vocal talent should be enough to get them to the final. HUNGARY: "Origo" - Joci Papai. Again I never really made a connection with this song during national finals season but credit to it for being (a) in a native language and (b) a break from the norm. Since the beginning of this decade Hungary have qualified to the final every year so this will probably continue that record. DENMARK: "Where I Am" - Anja Nissen. On a fashion note I think we're all relieved that she's wearing the red dress rather than the Bebi Dol-inspired combo she wore in the rehearsals. This song still leaves me cold and I am genuinely unsure of how this will do. Yes she can sing, but it all turns into an outbreak of big singing, and that didn't bode well for Albania or Georgia in semi-final 1. If this had been in semi-final 1 it wouldn't have made it, but in the weaker semi-final 2 who knows? However the non-qualification record of the past couple of years doesn't bode well. Dying to try to remember that this song is not called Trying to Die, but Dying to Try. Whatever it's called it's just a soggy old boyband album track which you just press the skip button on. Young and cute will only take you so far, and in a semi-final where he'll be up against the vocally superior Kristian, then Brendan is likely to lose out in the battle for the cute-young-boy vote. 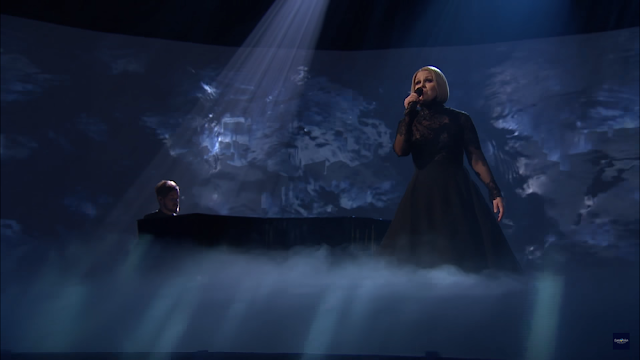 SAN MARINO: "Spirit of the Night" - Valentina Monetta & Jimmie Wilson. No doubt Valentina is a Eurovision legend within the fandom, but that means nothing to a casual fan or a jury member with no prior ESC knowledge. This is another Ralph Siegel effort and is a tribute to the 70s disco sound, with a bit of "One Night Only" thrown in. They are good singers, yes, but outwith the fandom I can't really see it having much wide appeal. CROATIA: "My Friend" - Jacques Houdek. 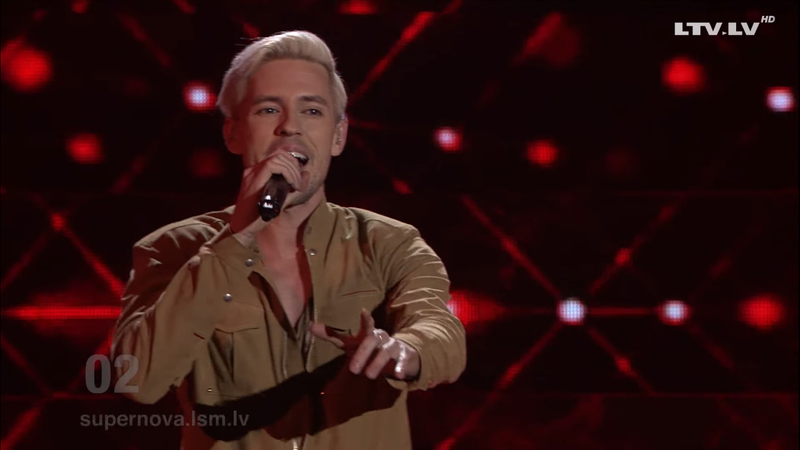 I remember this guy from the Croatian national final a few years ago, singing "Break A Leg". He was beaten by Darja Kinzer, the song eventually became "Celebrate" and failed to qualify for the final in 2011. Jacques might have the last laugh though as this is a completely bonkers, original and memorable concept which will be enough to get him to the final. Jacques is duetting with himself as opera singer and r'n'b singer. He has an impressive voice but the song for me is pretty hideous. NORWAY: "Grab The Moment" - JOWST. I might have been underwhelmed by this year's MGP final in Norway but this was an immediately likeable winner. It's modern, but in a good way. It's catchy and well-sung, and very accessible. 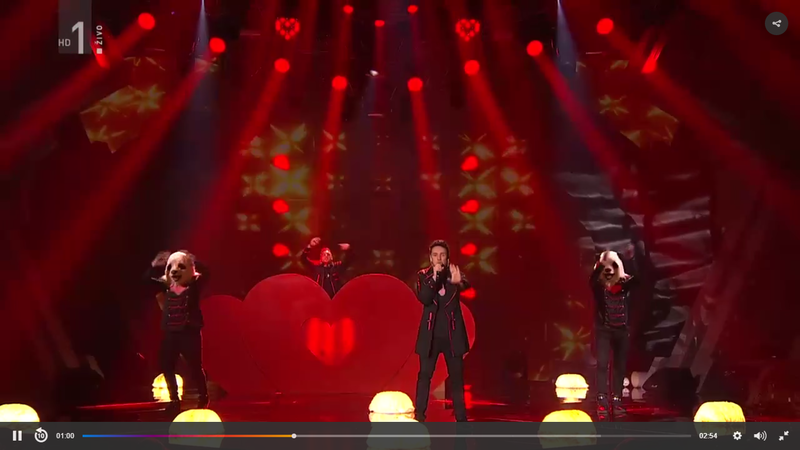 I have been a bit concerned about the controversy around the vocal samples and hope that this doesn't eventually lead to taped backing vocals being allowed - that would ruin ESC, the same way it has ruined Melodifestivalen. Ah, Switzerland. Eurovision's first ever winners - and eternal underachievers ever since. This is just one of the emptiest songs for me this year. The singer's yellow dress is hurtling towards the Barbara Dex award whilst the chorus ("I'll follow you Apollo") is just plain stupid. BELARUS: "Story of My Life" - Naviband. 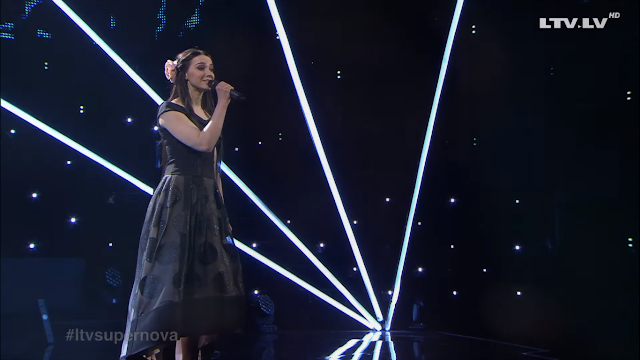 Belarus' first ever entry in its national language, sung by a very appealing duo who spread joy in every performance they give. I would love to see this qualify but I'm worried as the country's qualification rate is not good, and the hey-heys can be a bit irritating after a while. BULGARIA: "Beautiful Mess" - Kristian Kostov. Kristian is only 17 but he has a vocal quality beyond his years, and he's also been one of the more high profile artists on the pre-party circuit. After Poli's success this year it's very clear that Bulgaria are becoming a force to be reckoned with at ESC. Kristian performs this song very well - but my main problem is with the song itself. It's just too dull for my tastes and is in the same Sam Smith-ballad category as the Aussie entry. It's one of the main contenders but lacks that something special to make it truly great. He is better than the song. LITHUANIA: "Rain of Revolution" - Fusedmarc. This song was this year's winner of Europe's most interminable national finals process. And at the end of it, the general view was...."is that it???". Along with Poland, Lithuania always has a strong diaspora vote - but on the other hand, "Attention" didn't qualify, and that was better than this. This has no redeeming features for me and I can't see it having any voting appeal, so that would normally make a non-qualifier. However: it's Lithuania, so expect qualification even in the most impossible circumstances. Yeah yeah! 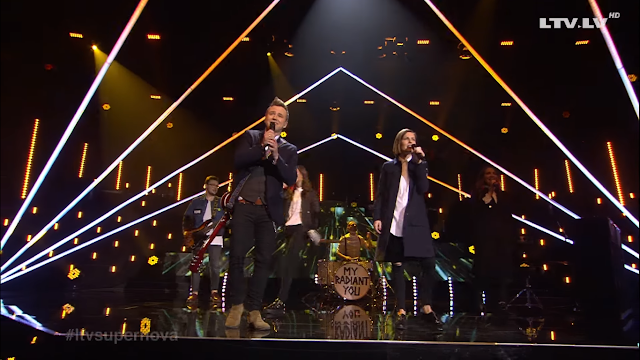 ESTONIA: "Verona" - Koit Toome and Laura. Is it too old-fashioned? Will the viewers get their interpretation of lost love? Will Koit and Laura find that chemistry? We will know this evening. I would just like to say that for me this is one of the more memorable songs this year, I remembered it after one hearing. Eurovision is a very different contest nowadays though, but in a semi-final of many below-par songs, this stands out as one of tonight's best. ISRAEL: "I Feel Alive" - IMRI. Another song which has underwhelmed me from the beginning, and I spent weeks and weeks getting this mixed up with the Cypriot entry even though they don't sound like each other (but because two good-looking guys!). If Cyprus qualified, then so can this. It's an upbeat and lively ending to a rather unexciting semi-final line-up. In just under 2 hours, the first semi-final of the 2017 Eurovision Song Contest kicks off in Kyiv, Ukraine. So here, as ever, are my foolish predictions about who will qualify for the final and who won't. I didn't agree with this song winning Melodifestivalen. Yes, it's a very slick and well-executed pop song but it's completely joyless. But it's slick, and it's Sweden, where polished, confident and professional come as standard. The swear word in the original version was unnecessary; the "ok" hand-signal is intensely annoying. The only redeeming feature for me is that I think the polo-necks have been replaced by shirts. I like polo-necks, but for me, shirts are better. It's this year's great lost Bond theme - there's always one - and the first outbreak of "big singing" this evening. I heard an interview with their Head of Delegation on the ESC Insight podcast and I was very impressed with his vision and ambition for Australia in Eurovision and eventually an Asiavision which has its own set of problems. Australia established very quickly that they "get" Eurovision. After Guy and Dami, this is a minor setback but more to do with the song than the artist. Isaiah is clearly a talented young man, this is well-staged if a little egotistical with all the faces in the background (which has become an unwelcome trend for me at ESC this year if I'm honest). The main problem I have with this is that it sounds like a Sam Smith song. Enough said. Although Isaiah delivers it well enough I guess. BELGIUM - "City Lights" - Blanche. This has been a fan favourite from day one, continuing that trend (of the RTBF-years anyway) of Belgium upping its game and becoming serious contenders, winners in waiting. No-one really rated Laura's song last year either and she did very well indeed. This song is working that Lana del Rey sound, a feeling of emptiness and isolation. It is very contemporary and I can see it doing very well although there have been some concerns over nervous rehearsal performances by this young singer (she is only 17 years old) and I hope that she has received a good level of care and support from the people around her, to help her overcome any nerves and cope with the biggest performance of her life. Just let me take a moment here, a moment of completely irrational thought. "Space" has been one of my most-played songs this year. I love this song in its studio version. It's packed with innuendo, the whole package is camper than the proverbial row of tents and as a middle-aged straight woman I'm probably a long way off from his target demographic but what the hell, I love him. Just watch out for that swinging plait......aargh! Too late! When it comes to the live version, there is one major problem. He can't sing for toffee and this will suffer the same fate as that other great-in-studio, car-crash-live camp dance banger fave of mine from 2009, "Dance With Me" by Zoli Adok. I said it all in my previous post, but just to reiterate, I love this. I've never been able to get too enthusiastic about this very modern, abstract mid-tempo ballad but credit to Azerbaijan for at least trying something a bit more edgy/leftfield this time round. However it may just go up in my expectations for the crazy staging. Put a man with a horse's head on top of a stepladder and now we can talk about this. 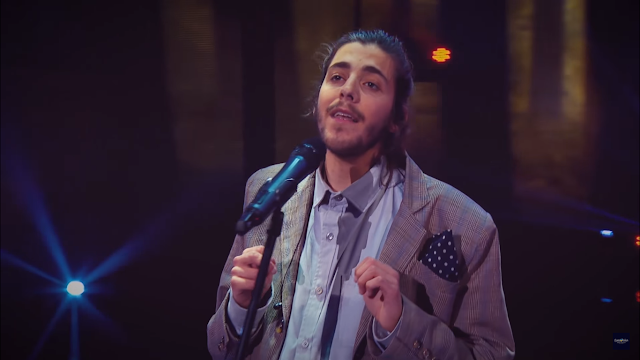 PORTUGAL - "Amar Pelos Dois" - Salvador Sobral. This is a rather sterile pop song from the team behind "You Are The Only One". She seems quite a likeable performer but there have been vocal issues (either from Demy or her backing singers) during rehearsals so I really can't predict how this will go tonight. After some thought I decided that it will very narrowly miss out on qualification, losing out to Moldova. Although (covering my back here!) it could go either way. It's hard to review a Polish song without mentioning the "D" word who strongly mobilise when it comes to the televoting. So it feels like they have an automatic pass to the final. Kasia is a strong singer, so that should also ensure jury points. She is probably better than this rather drab ballad which should automatically be disqualified for that /desire/higher/walking the wire rhyme. And now it's time for some fun at Eurovision. OK so we don't want a load of throwaway novelty songs but it's nice to have a bit of light relief among all the serious songs and ballads, even if they are songs you love. Sunstroke Project are slick, professional and they look as if they are enjoying themselves. And they have Epic Sax Guy. This is not much of a song though, but they could be a shock qualifier thanks to the fun factor - however it may just be too lightweight when voting time comes round. So I have it qualifying by a thread in 10th place. PREDICTION: Qualifier (borderline with Greece). I have desperately wanted Iceland to win ESC for years, but these days I'd settle for qualification to the final. This is strong, and she is a strong performer. But it is coming across as a little too cold and clinical, and in a field which also includes other cool electro songs I worry that this is going to get lost. I would love to be wrong though. I really wanted to love this - it's a G:son song, and Hovig is a good looking guy. However, I can't get excited about this song at all and it has never grown on me. I just can't see it qualifying in this cut-throat semi-final. Ethnic and mystical. Armenia, more than any other country in the modern Eurovision, know how to absolutely elevate a song which doesn't sound like much in the studio version, and turn it into a strong Eurovision entry. They "get" the vision-part. So it was last year, when the performance and staging of Iveta's song blew everyone away. This isn't quite up there, but Artsvik is a strong singer although my problem with this song is that it lacks a definitive hook. 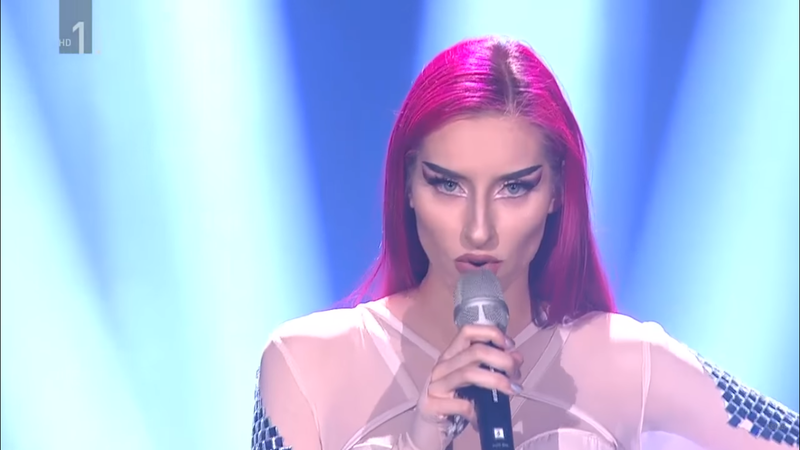 At the time of the Slovenian national final I thought this might have an outside chance of qualification, despite the criticism that it was too "old fashioned". But the same was said for Michal's song last year and how well that did. But aah, there is no "Slovenian diaspora", then they went and revamped the song, ruining anything which was good about it. Since that Slovenian final I discovered a very unpleasant fact about Mr Naber - he served a prison sentence for sexually assaulting a young woman in a nightclub. He may have "done the time" but for that reason his presence just taints this contest and I can't bear the sight of him. We end the first semi-final with the entry from one of my absolute favourite ESC countries, from a band who are completely true to themselves. Yes, "Line" is repetitive, but it is also a welcome break from the heavy/arty/abstract ballads and the sterile pop songs. And when that rave-breakdown comes in after the second chorus, it's a euphoric moment like no other. This brings a very welcome change of musical style and like Georgia last year, it's needed in the final. It's usually the second semi-final is traditionally the strong one, however tonight's semi-final has been a very tough one to call. We'll see after tonight just how many of my predictions are right. So have a great night everyone and enjoy the show! It's a very unusual feeling, having this year's favourite as my favourite too. The first time I heard "Occidentali's Karma" was when it won Sanremo and I immediately loved it. That doesn't usually happen with me, and songs, and it takes a special song to appeal to me on first listen. This was an explosion of joy, a catchy and appealing song fronted by a likeable and charismatic performer. One man.....and his gorilla. Of course those who haven't bothered to read up about the meaning behind the lyrics will just think that this is a novelty song with a dancing gorilla gimmick. But we know differently, don't we, friends! I like this song so much that I even bothered to learn all the Italian lyrics and can sing along with it. Then of course there is the dance routine, so simple that everyone can do it. There is a lovely little moment towards the end of the national final performance where Francesco and Mr Gorilla are out of sync on the dance routine, but it doesn't matter. Francesco wrote this song and in his performance he completely makes that connection with the viewers. He is an absolute showman and clearly conveys that he is enjoying every moment of this. I missed the Portuguese national final so didn't hear the winning song until the next day. The first time I heard this song, I began to cry, such was its emotional impact on me. Again, it takes a lot for a song to move me in this way on first listen. And then I read the lyrics translation and just sobbed again. Salvador's performance was unique, honest and completely true to himself, on a song written by his sister Luisa. This is a timeless song - that's "timeless" and not "dated" by the way. I played this song to faithful travelling companion (not an ESC fan) at the weekend and he said that it sounded like a classic old jazz song. Something from the Great Portuguese Songbook! People often refer to Salvador as "Salvadorable" and that is so true. He is such a sweet, gentle and unique performer, and when you know what you know about his health difficulties then you just want him to succeed even more. If "Occidentali's Karma" doesn't win, I wouldn't object to this song winning, and finally giving Portugal its long, long, long awaited first ESC win. My thoughts on this song have not changed since the Finnish final. I loved it then and I love it now. What really surprised me during the lead-up to this year's contest was that it tended to be forgotten about, and wasn't really rated in fan polls/rankings. That was until the rehearsals of course, when the duo of Leena and Lasse gave exceptional performances and suddenly many fans who had previously overlooked the song were talking about it. What "Blackbird" has in common with my other two favourites is its emotional impact. I am not a ballad fan as you know, but will make an exception for those songs which move me in different ways. I have "something in my eye" when I listen to the Portuguese song. When I listen to this dark song, "Blackbird", there is just this chilling feeling of loss and sadness, yet of anger and strength too. I don't know if that's really the right way to describe it but they're the best words I can use right now. This is Finland's best ESC entry in years. Now, where did I put my notes on the deep emotional impact of the lyrics and performance of "Do It For Your Lover"?........OK then, maybe not. In my next post I'll be attempting to predict which songs are going to qualify from tonight's semi-final. Just an explanation before I go on - I have still to post my Melodifestivalen 2017 reviews but as these are rather extensive and my time is consumed by both Eurovision and upcoming holiday preparations, I've decided to leave these until nearer the end of this month. Although I haven't been blogging or tweeting very much over recent months - due to lack of time/health reasons - I have extensively followed the lead-up to the contest over the past 5 months, through national final season to the pre-parties and finally to the rehearsals, watching every video clip, downloading and listening to lots of podcasts etc. As ever at this time of year I want to thank all of you who put so much work into bringing ESC season alive, particularly for those of us whose Eurovision experience is confined to watching the contest on TV in the living room :) I'll be watching both semi-finals but this year, due to what I can only describe as a scheduling conflict, I will be on holiday and "off the grid" on the night of the final. Call me a bad fan, but it was unavoidable as I could only go on this particular date. Anyway, I haven't missed an ESC final since 1997 and we know what happened then! "That was a pretty significant night for me, as it would be the first time since the early 1970s that I hadn't been at home on the evening of the contest due to a prior engagement. On the way home by taxi, the driver had the radio news on, and I heard the announcement that the UK had won Eurovision. My first thought was, for goodness sake, I really must be drunk!! Did they just say what I thought they said?" I haven't written much about this year's ESC on the blog or on Twitter so I thought I'd take the opportunity to give you a little overview of my feelings about the contest this year. As national finals season progressed, I was beginning to feel that this was going to be another one of those "meh" years, dominated by ballads and songs lacking memorable melodies. As I say every year, I'm an old-school ESC fan who still puts "the song" above all else. If a song moves me in any way - whether it makes me happy, or sad, or just makes me want to dance, as long as it makes that crucial connection, then that's enough for me. However, I have also moved with the times and accept that the modern-day ESC is as much about the Euro-"vision" and the importance of costumes/staging/camera angles/choreography; at their best, these can make or break a song's chances. Nevertheless, I've watched all the rehearsal footage and nothing has changed my mind. I still love the same songs and although there are others which I'm not so keen on, I wouldn't go as far as to say that I hate any of the songs (ok then, maybe there is one, which is quite popular but which I would detest the idea of it winning. More on that in a later post) because the bar has been raised so high over recent years and every artist and their delegations put so much work in delivering the best possible performance they can. One of the very nice aspects of social media, which has transformed the Eurovision Song Contest beyond recognition over the past few years has been the way that the contest has brought all of us together in the fan family. Over the past 2 or 3 years however I have also noticed the artists developing a strong camaraderie with each other, thanks to the many pre-parties and also on Twitter. This may be a contest, but we now see a lot of love, friendship and respect between the contestants, not to mention artists covering each other's songs or duetting with each other on YouTube videos. Honourable mentions to Spain's Manel Navarro and Austria's Nathan Trent. Probably the most bizarre clip is Switzerland's Timebelle doing a mash-up of this year's ESC entries to the backing of Ed Sheeran's "Shape of You". Proof, if any was needed, of the more "contemporary" nature of ESC songs. Although try telling that to the UK media who still think the contest is stuck in the 1970s/80s....! Forget the politics and the dark clouds - ESC should be celebrated as a competition like no other, a happy place and a genuine escape from the increasingly dark world around us. 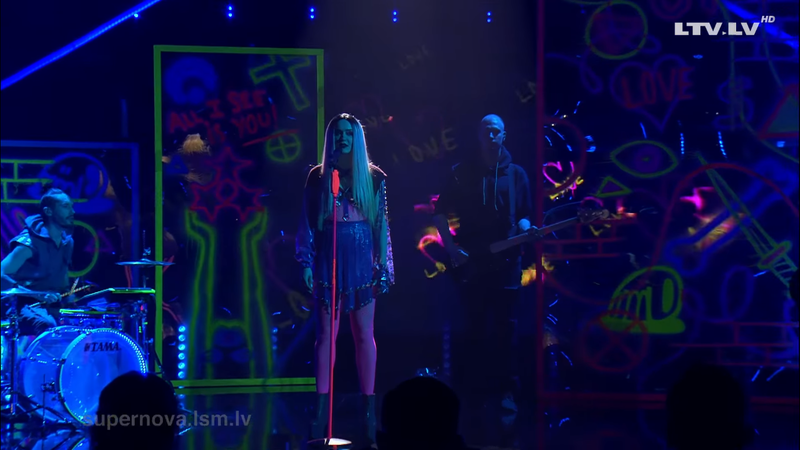 Although from the minute Ukraine won the 2016 contest with a song about historical events with an undercurrent relevant to more recent history, politics have never been far from the surface. Rewind to that crazy Sunday evening of 12th March, when within the space of a couple of hours we digested the news that Valentina Monetta was representing San Marino for her fourth time, and then we all headed off to Russia's Channel One to suffer our way through their news show - the things we do for Eurovision! - and eventually, at the end of the show, we got to see the Russian entry: a pleasant female singer Yulia Samoylova, singing a simple and rather saccharine song, "Flame Is Burning". 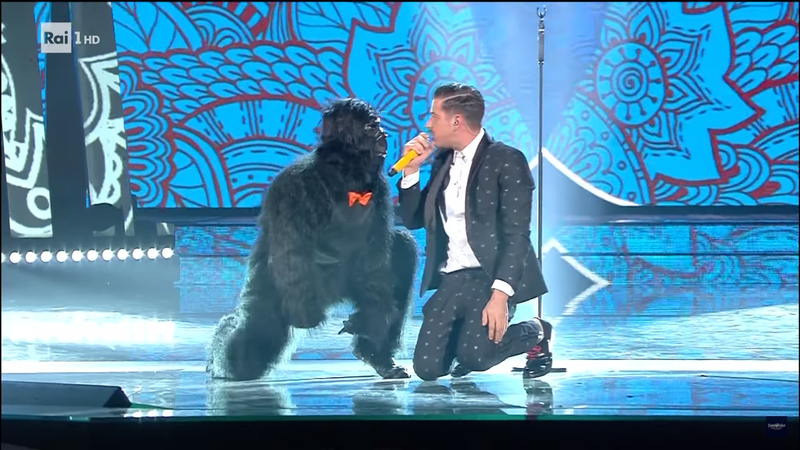 In a year where the contest's theme/tagline was "Celebrate Diversity", the Russian singer happened to be in a wheelchair. So far, so good for Russia, although by the end of the song, my thoughts were...."is that it?" Over the past couple of years, Russia have been winners in waiting, yet on hearing this song I just felt that they weren't even making an effort. They were "phoning it in" this time round. Just what was on their mind? Of course we would eventually find out what was on their mind. This was a classic exercise in manipulation: no-one would dare to criticise a singer in a wheelchair with a "nice" little song. But since Russia annexed Ukraine in 2014, Ukraine introduced a law banning any performers who have performed in Crimea. You would need to be completely off the scale of naivety to think that Russia had accidentally chosen a performer who'd played in Crimea. They knew what they were doing here. 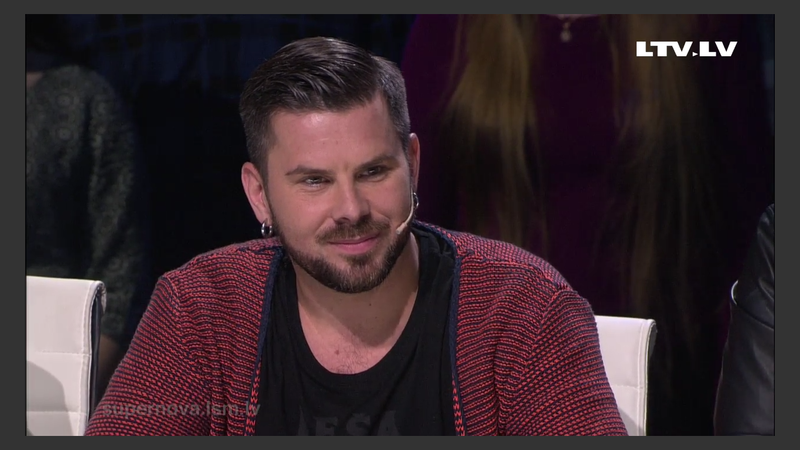 When Channel One eventually announced in April that they would not broadcast the contest and therefore withdrew, it brought a very troubled few weeks of Eurovision season to an end. So Yulia was effectively collateral damage - an artist and song which was never really a contender, sacrificed in an exhausting political stand-off. But that wasn't the end of it: Yulia will perform in Crimea while the ESC semi-final is going on. So it would appear that she wasn't such an innocent victim after all. As usual, the mainstream UK media will go down that same old road. The excuses are being prepared even as we speak, for why the UK entry will not do well this year. "Blame Brexit" they will say, in the same way that the Iraq war was blamed for Jemini's nil points in 2003, rather than their car-crash vocal "performance" and cringeworthy stagecraft. 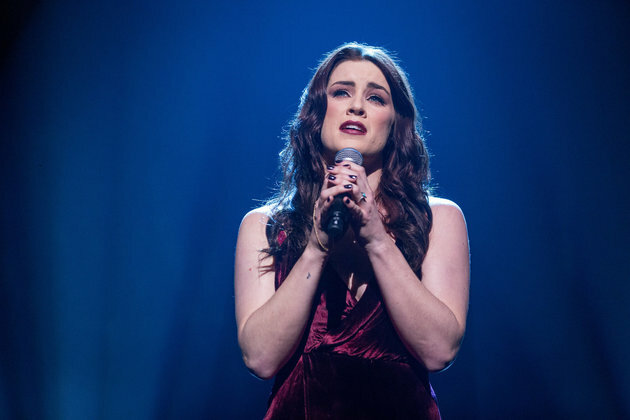 The UK this year is represented by Lucie Jones (above), with "Never Give Up On You" which was co-written by 2013 winner Emmelie de Forest. Although I'm not a particular fan of the song in its current form (I'd have preferred a dance-banger version, but that's just me) you can't argue that this is probably the best package of song and singer we've put together since 2009. At that time I described Jade Ewen's "It's My Time" as "a pile of mince" but what a well-performed pile of mince it turned out to be. The BBC really made an effort, and it proved that the more effort you put in will bring rewards. What we would give for 5th place now. Former X Factor contestant Lucie has gone on to establish herself as an actress and experienced musical theatre performer. This experience will serve her well on Saturday night and I have every confidence that she will do nothing less than her very best. She has been vocally flawless during the rehearsals and the pre-party season. For once the BBC have also made an effort with the staging - Lucie is standing inside a mirrored shell-like shape with the backdrop of a shower of golden firework-style lights. Whatever the result on Saturday, we can be proud of Lucie, who seems genuinely thrilled to be participating in Eurovision. This year's line-up of songs is a very strange one - for all the "meh" songs which either leave me cold or don't trigger any emotion in me at all - there is a spectacular trilogy of songs which are among the best Eurovision entries in years, so ESC 2017 may end up being a vintage year after all! In my next post I'll tell you all about my three favourite songs this year. It's always one of my favourite annual national final processes, and 2017 was no different. By this point, many of the national finals or internal selections were pretty underwhelming. Saturday nights were congested with heats, semi-finals and finals, so Sunday night brought pleasant relief from all that congestion with the heats, semi-finals and finals of "Supernova", the contest to choose Latvia's Eurovision entry. In 2015 and 2016 this proved to be a very successful format, thanks to two consecutive entries written by Aminata Savadogo, both of which ensured qualification to the ESC final. 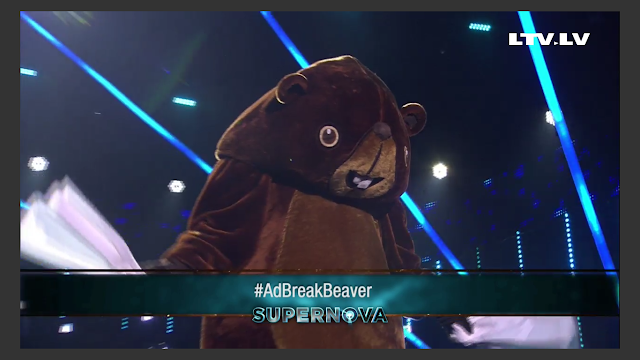 Yes, the legend that is the Riga Beaver was back again to entertain us over the weeks during the ad breaks, to the enjoyment of the fandom, the slightly amused confusion of the studio audience and the bemusement and dismissiveness of the professional jury. OK enough of the gratuitous shallowness and let's get to the music! Unfortunately he suffered from what I call "the Melodifestivalen law of diminishing returns" where recurring contestants return with weaker songs. "Dynamite" was a case in point. Compared to the great "Take Me Down", this was just dire. This time round he didn't even make the semi-final, never mind the final. Another Latvian national final contestant from the past returned this year. Linda Leen's "Who Is In Charge", (above) which made it as far as the semi-final, had bizarre staging and a very unusual musical arrangement. It was a complete mess, to say the least. Yet something strange happened. This song surprisingly grew on me and I ended up playing it rather a lot after Supernova ended. I still can't understand why I got into this song as it is jarring and screechy and all the things I hate, but there you go. Music still has the power to surprise. This year's Supernova took that most modern approach, including Spotify streams in the voting. Now you know I'm not a fan of streaming but it just shows how forward-thinking Latvia is. However, like all voting systems, streaming and YouTube views can be skewed, let's just say. There were suspicions surrounding unusually large Spotify streams for a certain artist this year for example; however, he wasn't disqualified. On 26.02.2017, four songs competed in the Supernova final. 1. "Your Breath" - Santa Danelevica. The kind of dull contemporary ballad which now pollutes national finals all over Europe - and sometimes even makes it as far as ESC. Throwing in a drum & bass backdrop "Walk On Water"-style is just a lazy box-ticking "let's make this contemporary" exercise. I didn't think this was worth a place in the final. 2. "I'm In Love With You" - The Ludvig. The Ludvig took the minimalist approach with a song which really didn't have much depth beyond, well, "I'm in love with you". I can understand its appeal I suppose - a young male singer-songwriter would get votes from young fans as well as old, and it ended up as runner-up. But after a couple of years where Latvian entries to ESC have had some depth and artistic quality, we expect more. If this had won Supernova, it would have got completely lost in Kyiv. 3. "All I Know" - My Radiant You. 4. "Line" - Triana Park. 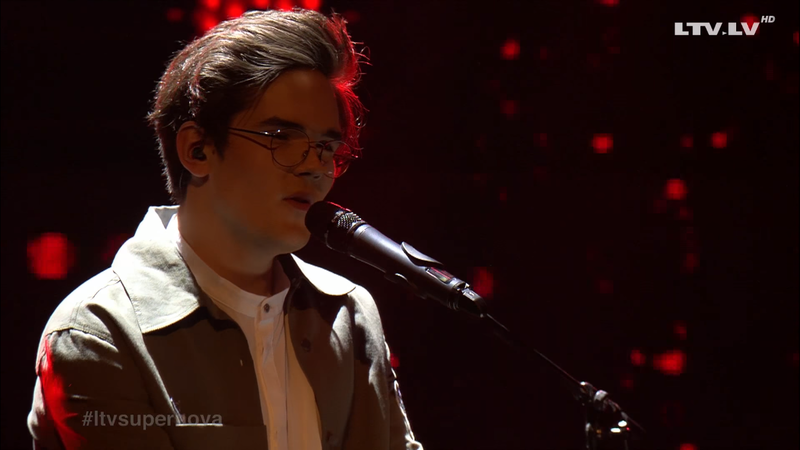 Even before the final I thought that this would be the best choice for Latvia's Eurovision entry this year, as it is yet another representation of Latvia's uniqueness in the contest. So I was delighted when it won, a resounding win too, well-ahead of The Ludvig even with his high Spotify total. I wasn't too familiar with Triana Park's music so I checked out some more of their songs and came to the conclusion that they are staying true to themselves and not compromising their style for Eurovision. Agnese Rakovska is a compelling frontwoman with her own amazing style. As for "Line", well yes it is a bit too repetitive, but then again people will remember it; my favourite part of the song is that mid-song breakdown after the second chorus, when Agnese brings the moves and the song just explodes into a euphoric rave classic. So that was Supernova for another year. I hope LTV use the same format again next year, as it's one of the most unmissable Eurovision national final formats every year. And as for our furry friend, he certainly didn't disappoint this year, with everything from his rapping and crazy dancing to his incredible improvisation. 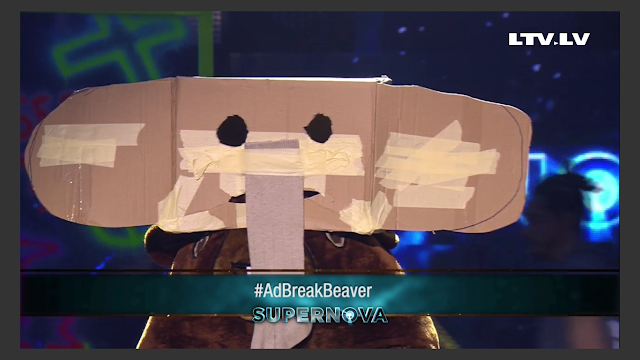 Our lives are all the more enriched in the knowledge of how to make an elephant mask out of a cardboard box. So thank you so much Riga Beaver. Hope we see you again in 2018! I've looked in on EMA over the past couple of years with mixed success - I enjoyed the 2015 final but it was virtually impossible to follow last year's final due to my poor internet connection. (I guess that national finals season 2016 was one of the main factors in my decision to finally get fibre broadband over last summer). 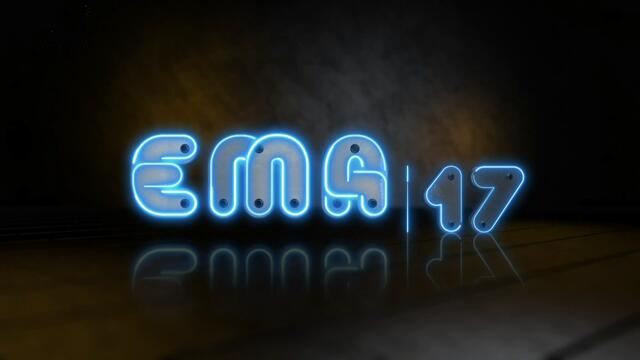 There were big changes in EMA this year - the contest was staged in a much larger venue than the usual TV studio, and with a huge leap in the production values and visual impact. This clearly shows a lot of ambition on RTVSLO's part, and it became one of my favourite national finals of 2017. The visuals were clearly influenced by Melodifestivalen though: from the 2014 'painting postcards' to the same font for song titles and the announcement of the songs and artists, Melfest-style. This year's two semi-finals/heats took place over two nights, Friday 17.02.2017 and Saturday 18.02.2017, where 8 songs competed each night for 4 places in the final. What impressed me straight off about this year's EMA was the variety and diverse musical style of the songs on offer: everything from rock to ska to experimental opera to Latin-pop to EDM to ethno-pop to traditional ballads. Swedish-based Maja Keuc, under her new artist-name of Amaya, was in the original line-up but pulled out of the contest beforehand, as this didn't fit in with her new career path. Hmm, strange one - I wonder if there were other factors behind this decision? I think the right songs made it to the final, although Tosca Beat's adventurous left-field opera number "Free World" which failed to qualify from heat 1, could have added an interesting dimension to the final. The 2nd heat fought for my attention on one of the very busy "Super Saturdays" when I was watching one of the Eesti Laul heats at the same time. 1. "Ne Panike" - Sell Out. I really liked this on first listen in its heat. Very inspired by "4 Real" by Athena, Turkey's 2004 ESC entry which is one of my all-time favourite ESC songs. Sell Out were dressed in matching black shirts and white patterned braces. The song, in Slovenian (extra points from me for native language!) was a feelgood catchy number with a brassy riff. We even got a bit of the mannequin challenge when the song stops in the middle. (Is that still a thing?) This song didn't get a lot of love from ESC fandom so I was probably in a very small minority here - mainly because it was a very welcome change from a lot of the generic mush which polluted many of the national finals this year. 2. "Flower In The Snow" - Nuška Drašček. There was also room in EMA for the more traditional ballads. Nuška was dressed in one of these big fussy creations which you only ever seem to see in ESC, with massive bat-earrings to match. This came across like a James Bond-style, dramatic ballad, and on first hearing in its heat I thought it was ok, however I didn't like it as much second time round. Although she sang well, in terms of an ESC entry it did not really have any distinguishing musical characteristics. 3. "Open Fire" - Tim Kores. He seemed a bit of a character in his postcard. Oh, I remembered this one - it owed rather a lot to "Heroes" a bit in the staging. I quite liked the song although he's not much of a singer and it all ended up a bit half baked. Love love peace peace - and a woman playing drums with burning fake cymbals. The song has an 80s uptempo pop-rock feel but that's ok with me. It's nowhere near a 2017 ESC contender though. 4. "Fse" - Nika Zorjan. First of the evening's tributes to Dinah Nah's hair colour and the first of the final songs co-written by Maraaya. "Fse" was like a Slovenian language companion-piece to "Here For You". No sign of the air violinist though! Nika came across as a likeable performer and she does well, although the chorus needed more oomph to live up to the song's promise. Ad break time again. Mercator, Hofer (which has the Aldi logo), Spar, and Mercator again! The Slovenians sure love their supermarkets. After a Sanremo-style random interview with some Ukrainian woman (?) it was time for the next song. 5. "Wild Ride" - King Foo. I don't have much to say about this. It was a rock-influenced song fronted by Slovenia's foremost Anastacia tribute act, and that's about it really. 6. "On My Way" - Omar Naber. Yes, that Omar Naber, who represented Slovenia the last time Ukraine hosted ESC so there was a little deja-vu vibe going on here. The song had quite an emotional pull for me (I was going through a bit of a low time during national finals season this year) and his vocals were strong but controlled, and the song has a big finish. However, his edgy look did not match the rather middle-of-the-road song. 7. "Heart of Gold" - BQL. One of the big pre-contest favourites and foregone-conclusion winner was "Heart of Gold", another Maraaya composition, sung by the young male duo BQL, pronounced 'be cool' (groan....!). The best way I can describe this song is 'acoustic reggaeton' with a flavour of the current popular style of Chainsmokers-style 'minimalist dance' and unusually a more contemporary song than you would expect in the traditionally more conservative Slovenian national selection. I can understand its appeal but for me the staging didn't work when the two singers were apart, and it only really made sense when they are together on stage. The vocals could have been a bit better too. Pink hair #2 from Raiven, competing in her second consecutive EMA. She brought her harp too. This was all very mystical and 'potential ESC entry' and also quite Aminata-influenced. The verses reminded me of "Bring Me To Life". If this was selected for Slovenia it would probably get lost among the other female midtempo ballads already chosen, and the lights effect on her catsuit would just be yet another been there done that gimmick. Another blast from a more distant past: Toni Cetinski with a piano-version of his 1994 Croatian entry "Nek Ti Bude Ljubav Sva" and a new uptempo pop-rock song "Laku Noc" . What's really annoyed me about this year's EMA was the use of fake cheering/applause which is a very unwelcome trend! I find this kind of thing really offputting and unnecessary and it became more and more annoying as the night went on. The third special guest was none other than ESC defending champ Jamala, singing what else but "1944" a song which still delivers massive chills, even if it's not to everyone's taste. More ads for sausages and Mercator cars etc but I'm getting a bit bored with Bosch dishwashers now. But sausages again! Enjoy - it's from Europe! After the jury vote Omar was in the lead and then the televote results are announced Melfest-style. BQL topped the televote as expected, but not for the first time in this or in recent years, we were in a situation where the winning song was not a unanimous choice. 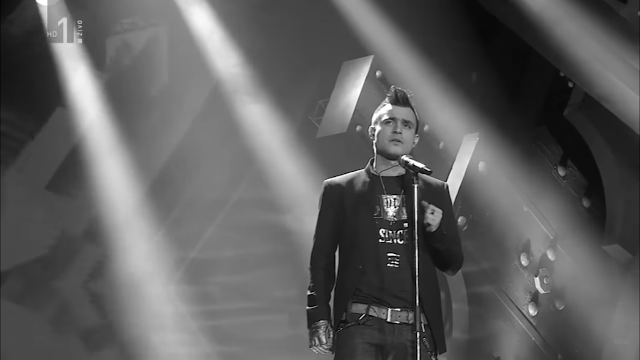 Despite the pre-contest momentum and expectation that BQL would win EMA, it was Omar Naber who would be going to Kyiv, representing Slovenia with "On My Way" which very quickly became one of the least popular songs among the fandom and written off as 'dated' and 'old-fashioned'. For those of us who still saw some redeeming features in a well-sung dated and old-fashioned song, it was then revamped to its complete detriment. The only way I can see this qualifying is a "Colo(u)r of Your Life"-style vote, although I think it's reasonable to attribute much of that song's success to diaspora voting, which Slovenia doesn't really have. So I may be wrong, but it looks as if Omar will be on his way....back to Slovenia after the semi-final.